Leblon—home of the rich and famous, and Rio de Janeiro's most affluent suburb. With beachside views looking out over the South Atlantic Ocean, abundant luxury hotels, condos, and mansions around every corner, this region has cemented itself as a highly desirable and sought after location. 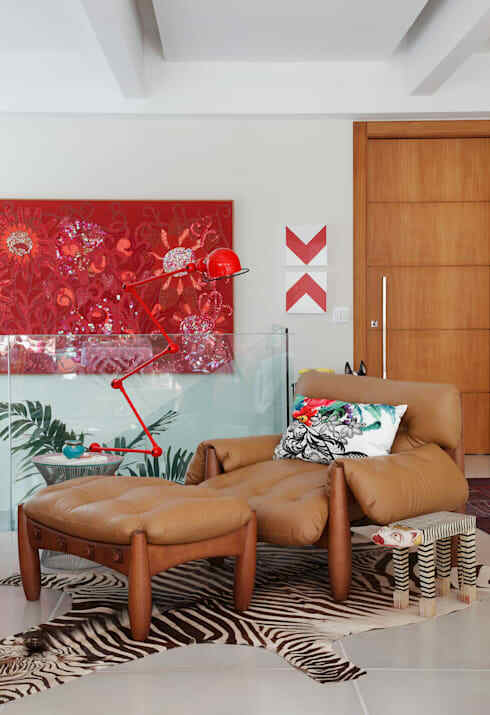 Situated directly next to both Leblon and Ipanema Beaches, the dwelling we are visiting today is a sleek apartment that has been designed by Escala Arquitetura. The 210 square metre residence was completed in 2013, and is a tropical oasis of luxury and opulence. 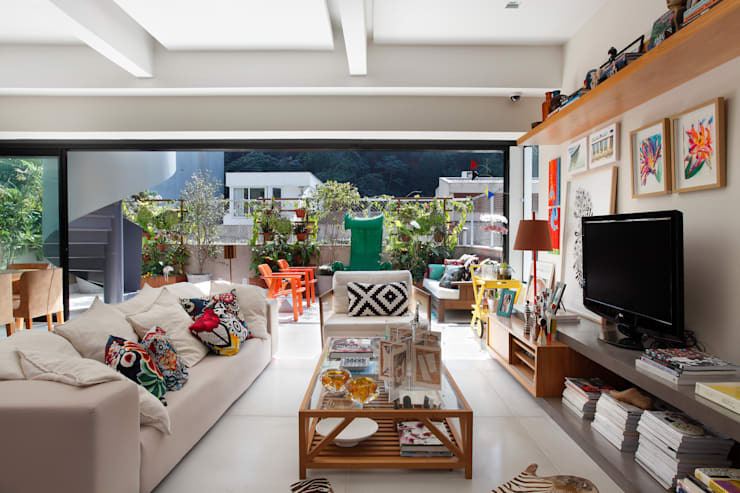 What sets this abode apart from all others is its colourful and vivacious interior design. Maximalism has been employed throughout the spacious interior and exterior living spaces, creating a welcoming, engaging and truly captivating home. Today on homify we are lucky enough to take a tour of this dwelling. If you are considering a home refresh, renovation or refurbishment, take some cues from this highly successful design, and renew your home with style and flair! Alice in Wonderland… in Rio de Janeiro! First off, we are taking a look at the unbelievable terrace. This Alice in Wonderland-esque space oozes appeal, and is truly enthralling! 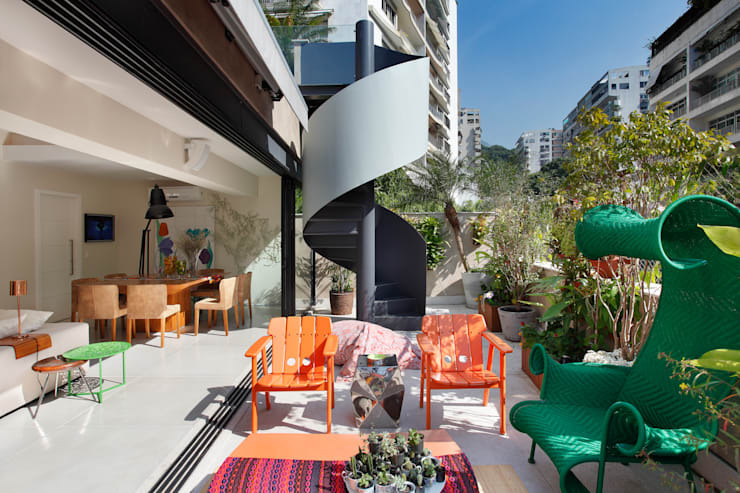 With its bright hues, outrageously unique furniture, and spiral staircase, this cartoon-style exterior is an attention-grabbing courtyard. Unlike anything we have seen here at homify, the innovative use of contrasting colours works beautifully to engage the occupant, and transport them to another land. The bright orange works excellent against the caricatured forest green seat, looking inventive and also intriguing. Looking from the other direction we get a better look at the coffee table, and other seating available. The sofa to the right is sumptuous, and perfect for lounging around on a hot summer's day. The adorable knot stool adds to the eclecticism of the space, and presents a truly eye-catching place to rest. Decorating exterior courtyard spaces can be tricky. There is often the challenge of ensuring the space is welcoming, neat, organised, as well as practical. All of these considerations can lead many to implement a rather standard approach; simple design, furniture, and a timeless aesthetic. Now, while this is a great way to adorn and decorate your exterior courtyard, this design takes the plunge into creativity and abundance, with fabulous results! Inside, the eye-catching design has been continued. We are able to see the bright courtyard in the distance, but now all eyes are on the main living space. This room features carefully chosen pieces of furniture and accessories. To the left of the image we see the huge white sofa. Here the designers and architects have included white to balance the space, and paired with patterned throw cushions, this space is truly unique. In the centre of the image, near the entrance to the exterior terrace, there is also a single chair with a cushion that adds another sitting space. To the right of the room we see the television. This sits upon a bespoke joinery system that acts as storage for the room, while also contributing to the eclectic mixture of furniture. The room is light, and surprisingly well illuminated from both natural and artificial sources. Shelving and storage are no forgotten either, with many different surfaces providing a place to hold all manner of living and household appurtenances. Finally, the architectural design of this apartment means the huge sliding doors are able to be opened up. This allows a colossal amount of fresh air to flood the home, and also ensures the perfect entertaining space. Maximalism is a relatively new buzz-word for interior designers. Although this style has been around for many years, it is enjoying a new-found resurgence in popularity. Essentially maximalism is a response and rejection of minimalism. This reaction to minimalist living creates an abundance within the living spaces, and ensures the occupant is figuratively swimming in objet d'art, furniture, and other ornamentation. Not simply the number of items within a home, maximalism also pairs different textures, patterns and colours, adding to the impressive and sometimes breathtaking interior effect. 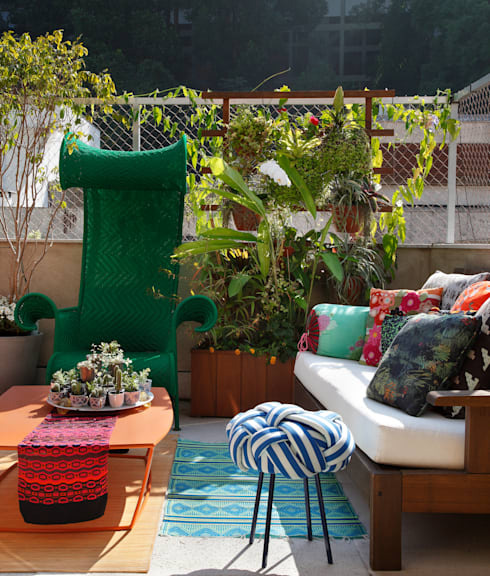 Within this Rio apartment, we see a form of maximalist design taking place. Especially within the living room, a profuse number of curios, images, and other accoutrements have been added, looking facinating and captivating. Again colour is utilised along with patterns to create an area of intrigue, style, and excitement. Square tables are a great design when you are attempting to create a convivial and welcoming dining space. Here in this image we see the gorgeous square eating area with room for eight individuals. Illuminated by a contrasting statement lamp that sits poignantly above the space, the room is set up for a glamorous and fancy dinner party. We again see the sliding doors, and the huge floor to ceiling glass that brings in a huge amount of natural light and fresh air. To the left is a unique piece of art, injecting more colour, and working surprisingly well with the entire space. Next stop: the bathroom. 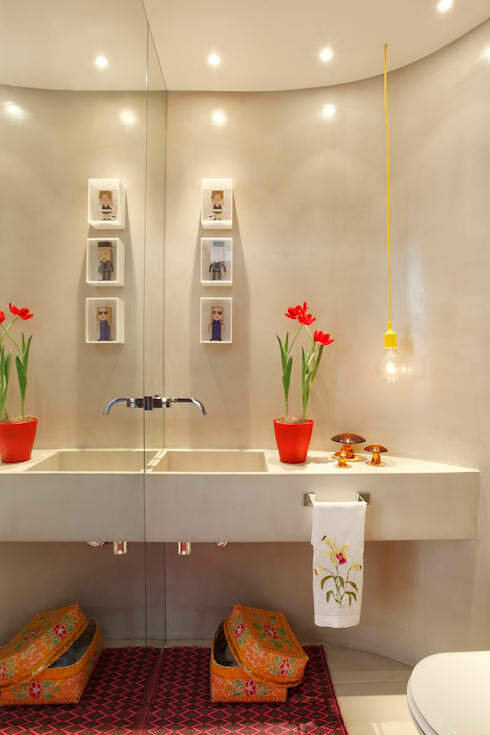 This enchanting washroom again imparts a whimsical and buoyant ambience that is similar to the exterior courtyard and terrace. Delicate colours are combined, mixed, blended, and create a space that is both captivating, and yet subtly enjoyable. Mirror is employed to create a larger and more spacious room, while the curvature of the wall ensures a soft warmth to the overall aesthetic. Every home needs a place where you can rest, relax, and read a good book. 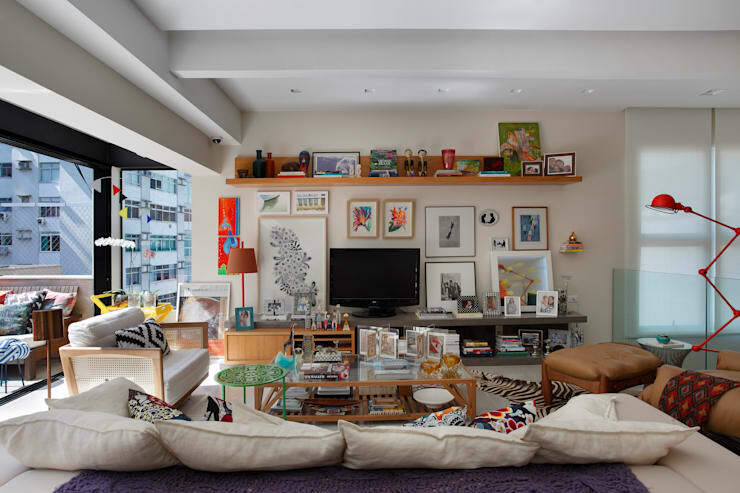 Here in this apartment there is an ideal space in the corner of the living quarters. Replete with an overstuffed brown leather chair, this area is perfect for those lazy days, nights, and moments when you simply need to put your feet up and relax. 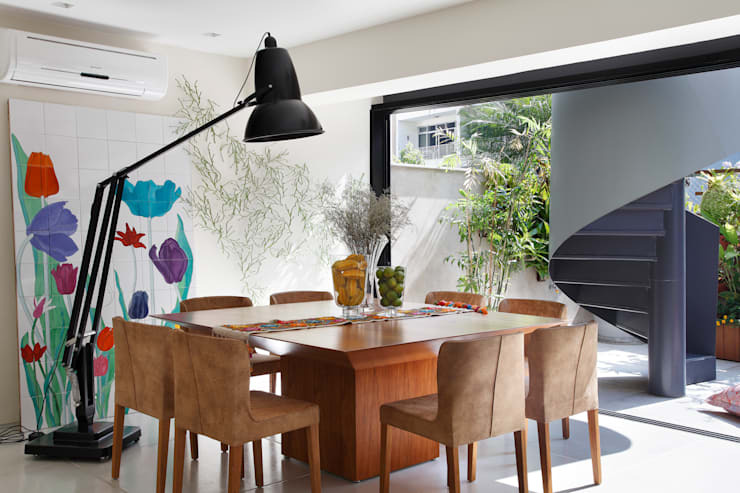 Space has been maximised throughout this dwelling, with the architects exploiting every nook and cranny to ensure the rooms are practical, liveable and stylish. 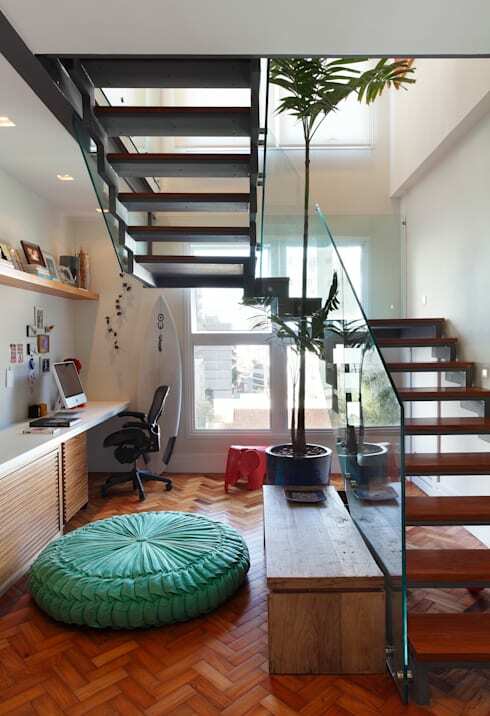 This stairway space is a great example. Here the normally useless area under the stairs would be turned into a simple void, but instead it has become a gorgeous workspace. Featuring large floor cushions, potted plants, and bespoke joinery, this is one area that provides functionality, versatility, and sophistication. As we come to the end of our tour, we take one final look inside the main bathroom. This area is quite minimalist in comparison to the other internal spaces. The huge mirror is back-illuminated, and the timber tones add contrast to the overall room's theme. 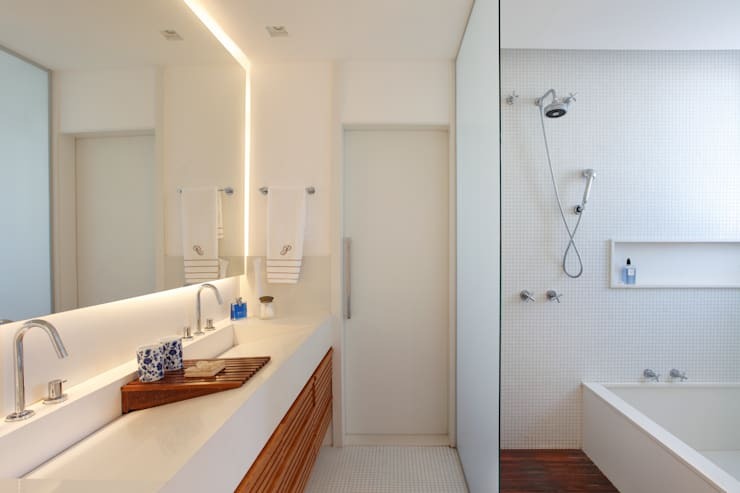 Within the huge walk-in shower we see a bathtub, imparting a sense of luxury and comfort to this truly unique and gorgeous abode. What were your favourite elements within this home? Did you like the maximalist approach? We'd love to hear your thoughts in the comments below!